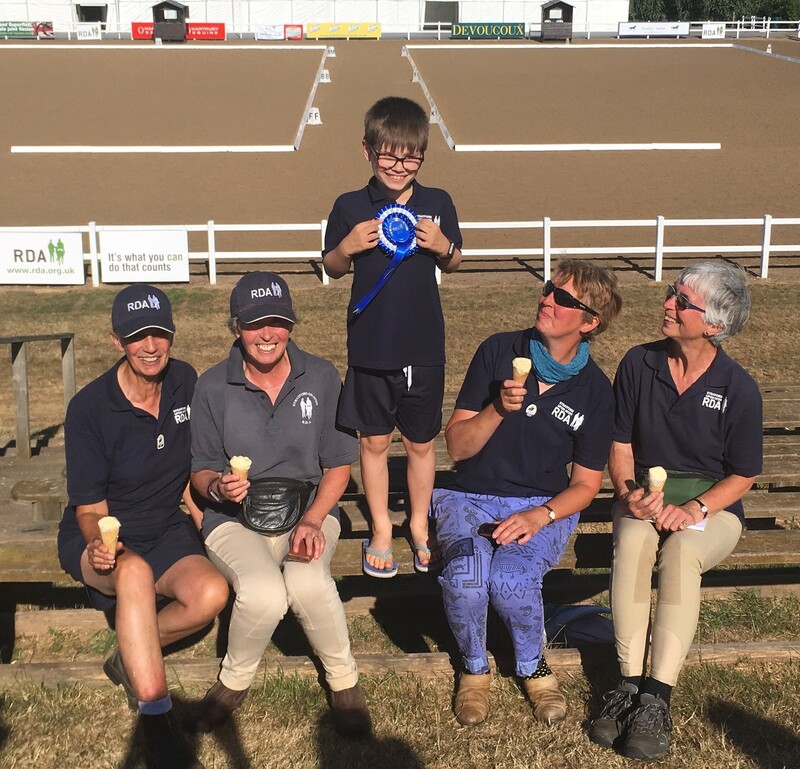 Once again the well-oiled machine that is ‘Team Stratford’ swung into action, as three dazzling ponies arrived at Hartpury College on Friday evening to take part in the RDA National Championships. They were met by our hard-working volunteers, who were assisting with running the event, as well as looking after our ponies. It was already warming up early on Saturday morning, as Pat and I took the opportunity to familiarise Kiera and Alfie with the surroundings. Jules was first to compete on Kiera, performing a good round in the countryside challenge, scoring particularly well on the gate. It was lovely to see Jules so relaxed and comfortable riding Kiera, and despite a lapse in concentration at the apple trees, they achieved 4th place in their class. A brilliant start to the day. Apples Alfie -theyre not real! Next was Sophie and Alfie, also in the countryside challenge. Their relaxed, fluent, accurate round gained high marks and very positive comments from the judges to gain 6th place. Well done Puffin getting top marks for your leading technique! Sasha guided Alfie round the CC course, to produce an accurate, active performance, showing good control and scoring top marks for the trot. They gained a well deserved 3rd place with over 90%. Great result. Lewis was unphased by a last minute change of pony and was very at home on Kiera. He produced a beautiful round, scoring a 86% to come 2nd in his VI class. A brilliant performance against stiff opposition. A real achievement for our Group, to have all our countryside challenge riders in the ribbons. First-timer Charlotte took it all in her stride and was full of confidence riding Kiera in the dressage arena. They performed a lovely, obedient test, scoring 60%, just 9 points behind the winner. A huge achievement for her first time at National level. Since qualifying Charlotte has worked hard to improve accuracy, use of the arena and spatial awareness, this was reflected in positive comments on her dressage sheet. Well done Charlotte. Our independent rider. Isabella and her pony, Cookie, had a busy weekend. On Friday evening they were 2nd in the level 2 showjumping and 5th in the showing class to qualify for the SEIB showing finals in September. On Saturday they gained 1st in the Grade 4 dressage class and also won Best Turnout, with a massive 87%. A very successful weekend for them both…. not forgetting groom Brit! Several of our riders also proved their knowledge of horse care. Sasha and Sophie achieving distinctions in the quiz and Isabella scoring a creditable 75% in the advanced section. Next post: Our new classroom has arrived! Whoopee!!! !